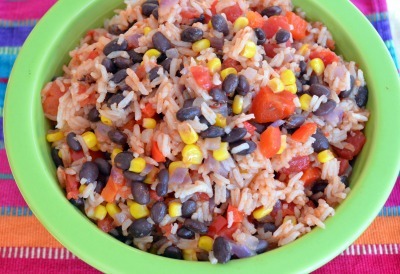 Are beans and rice regular ingredients in your menu planning? 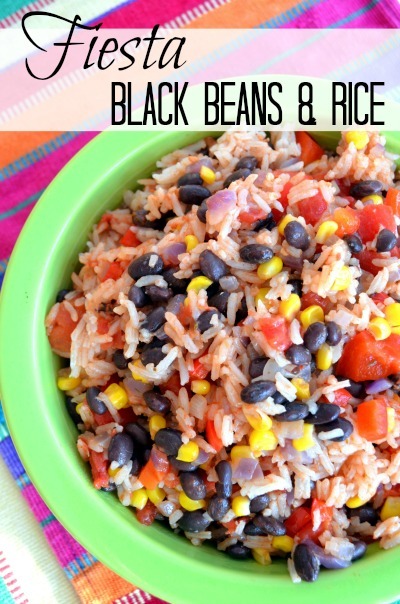 Sometimes the combination can get boring and bland, but Fiesta Black Beans & Rice makes a great side dish or even the main course–just add a side salad. This is a large recipe, so I used the leftovers the next day in wraps with leftover cooked chicken, avocado, and salsa. Have you ever considered cooking dried beans from home instead of buying canned beans? The cost savings of cooking beans at home are minimal, BUT home cooked beans are better tasting and have significantly less sodium than canned. Read my How to Cook Dried Beans post to find out how easy the process is. In a large skillet, heat the olive oil over medium heat. Add the onion, garlic, and pepper and cook until soft, about 4 minutes. Add the rice and cook for 1-2 minutes, stirring constantly, so as not to burn. Add the water, spices, beans, corn, and tomatoes. Bring to a boil. Reduce to a simmer, cover, and cook for 15 minutes or until rice is cooked through. This is so good and we don’t get tired of it! Thank you for this! Thank you for the feedback, Jacqueline! I’m glad you enjoy it.